This is the third post in a series on portfolio management reports. In the first post, we reviewed introductory portfolio management reports that convey the basic dimensions of the portfolio. 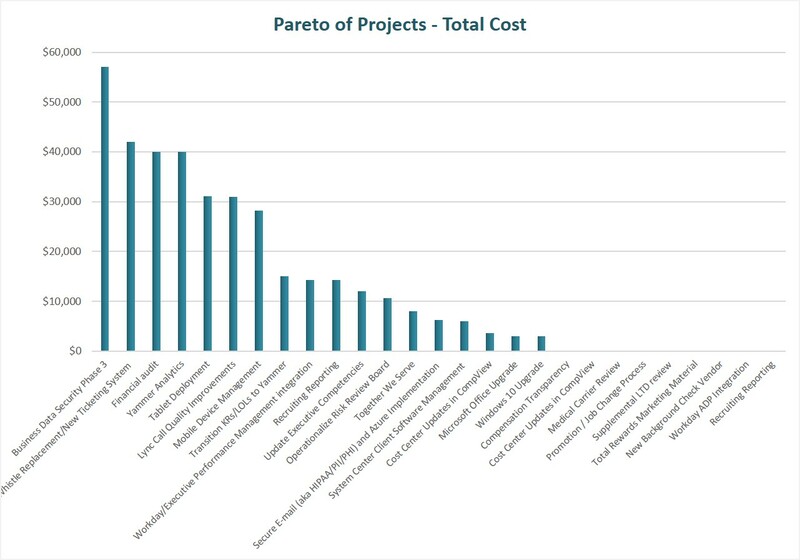 In the second post we reviewed treemaps and advanced pareto charts that can help identify outlier projects worthy of more scrutiny. In this post we will look at the most common report for project portfolio management, portfolio bubble charts. 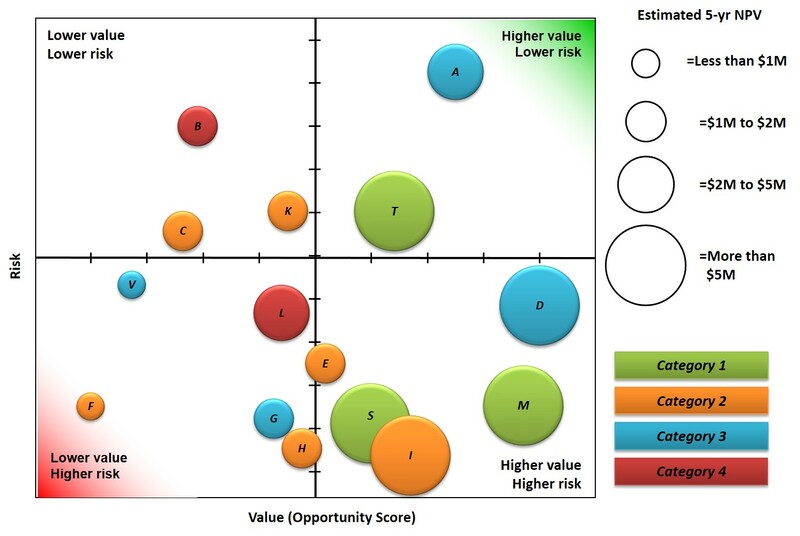 The risk-value portfolio bubble chart represents a portfolio view of all projects and puts projects into one of four quadrants based on value and risk; this is important for identifying projects that drive overall greater value to the organization compared to other projects as well as highlight projects that should likely be screened out. One of the key benefits to a portfolio bubble chart is to quickly show the balance of the current portfolio. Using portfolio bubble charts with the portfolio governance team can focus conversations to help better manage the portfolio. When reviewing projects that are in the higher-value/ lower-risk quadrant, the portfolio governance team should ask the question, “how can we get more of these types of projects in the portfolio?” Likewise with the lower-value/higher-risk projects, the portfolio governance team should ask how to avoid those types of projects. These discussions will greatly enhance the management of the portfolio and enable the portfolio governance team to “manage the tail” and ensure that only the best projects are selected and executed. There are four primary data elements needed to build the risk-value bubble chart: value scores for each project, risk scores for each project, categorical data, and the project cost or financial benefits of the project (commonly used for bubble size). 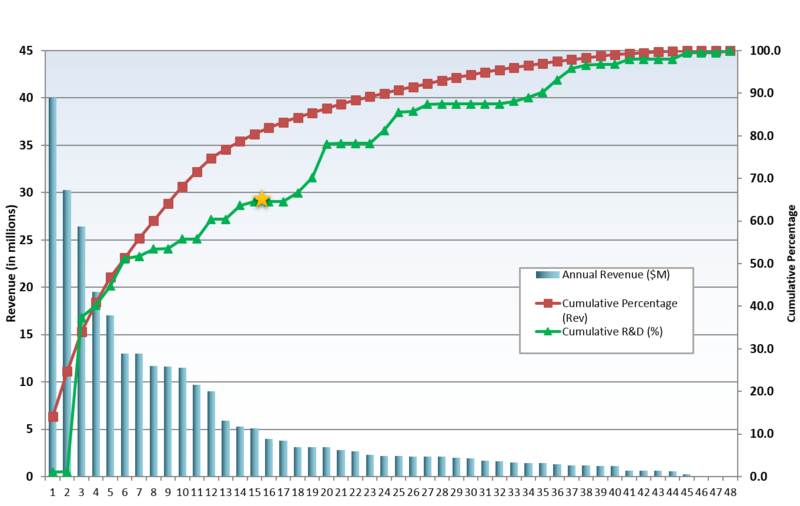 In an older post, I wrote in detail on how to build such a chart in Excel and the notion of normalizing the data. A prioritization scoring mechanism is typically required to build the best portfolio bubble charts. In a previous post, I wrote that from a very pragmatic point of view, getting the right data to leadership at the right time is at the heart of good project portfolio management. If the right data is not available for decision makers to use, the issue will be mediocre results at best. In actuality, the right data needs to be used to create the right reports to support strategic decision making. Hence, strong portfolio reporting must be a core capability for any organization utilizing portfolio processes. If you are not creating the right reports, then how well is your portfolio process actually working? In the next few blog posts we will look at various types of portfolio reports, starting with basic reporting and concluding with advanced reporting. The intention is to provide a quick visual overview of a certain category of projects (e.g. that align to a strategic goal or which belong to a certain sponsor). 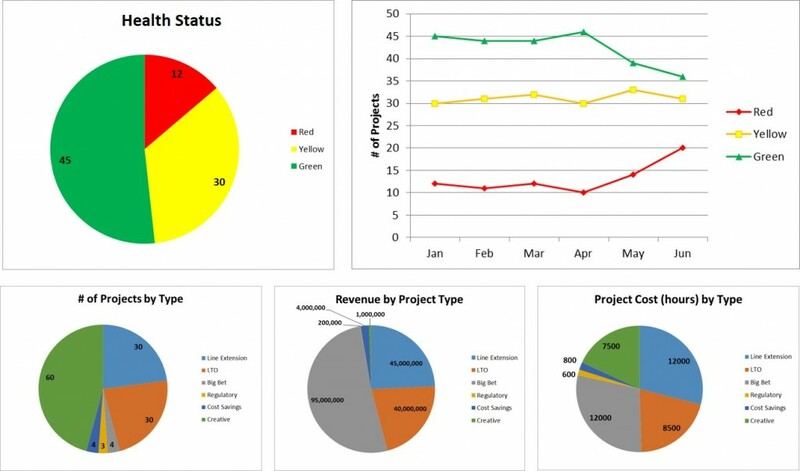 These charts provide a quick glance of projects sliced in different ways. There may not be much insight, but simple charts like this could highlight possible gaps in the portfolio and are useful for focused discussions around certain types of projects. 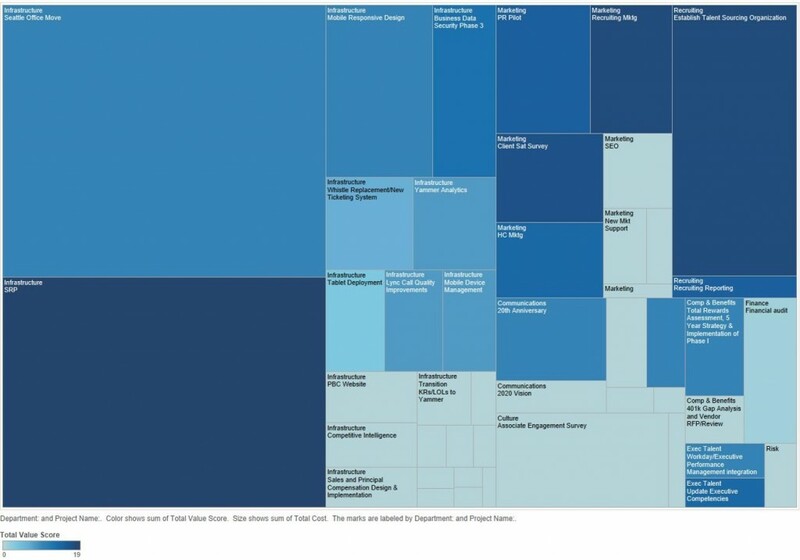 Pie charts are really just a snapshot in time, but when data is collected over time, we can also graphically depict trends, which can uncover portfolio gaps. Such gaps highlight areas that need more governance attention and help facilitate focused discussions around managing the portfolio. Organizations need to collect the following data in order to create these reports: categorical data, financial metric (cost, value, etc. ), resource hours, etc. In the next post we will look at more intermediate portfolio reports. In the meantime, what are your favorite portfolio reports? What has worked well for your organization?